Abies nordmanniana 'Kilian' is a dwarf, flattened-globose selection of Nordmann fir with dense, layered branching and long, glossy, incredibly dark-green needles. After 10 years of growth, a mature specimen will measure 24 inches (60 cm) wide and 18 inches (45 cm) tall, an annual growth rate of 1.5 to 2 inches (4 - 6 cm). It is not known to create a lead shoot and become pyramidal, a trait quite common in dwarf selections of this species. 'Kilian' is a good choice for xeric rockeries and esoteric conifer collections, particular in Mediterranean-type climates. This cultivar originated (presumably) as a witch's broom, found and introduced to the nursery trade by Daglezja Nursery, Ryki Poland. At the time of publishing this record, 'Kilian' was quite common in the European nursery trade, but nearly unknown in North America. 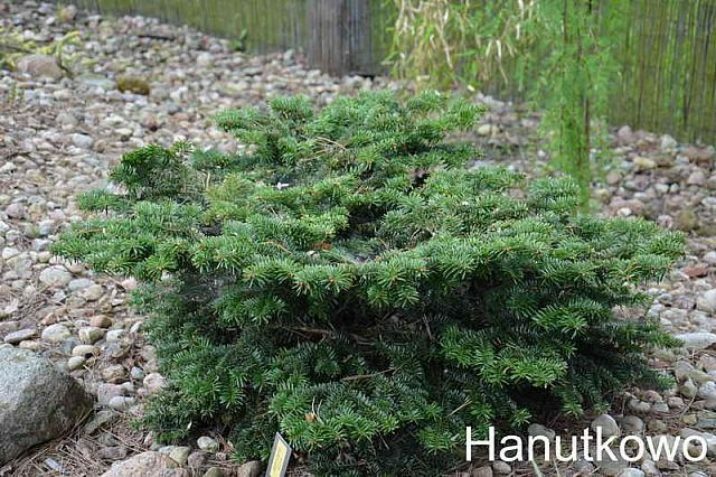 Abies nordmanniana 'Kilian' in a nursery display garden in Poland.